Inventory We are a resale marketplace, not a box office or venue. Ticket prices may exceed face value. This site is not owned by Fiddlers Green Amphitheatre . 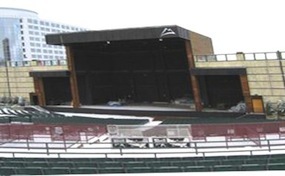 The Fiddlers Green Amphitheatre is the premier venue in the Denver metro area to catch the summer concert series. The venue has gone through some recent name changes from the Comfort Dental Amphitheatre to the Coors Amphitheatre and back to Fiddler's Green before changing again in 2010. The Comfort Dental Amphitheatre box office is located at 6350 Greenwood Plaza Blvd. The Amphitheatre opened in 1988 and seats 18,000 including 7,500 fixed seats and another 10,500 general admission seats. Some of the most popular Comfort Dental Amphitheatre tickets have included Stevie Wonder, the Jonas Brothers, Rod Stewart, Aerosmith, and many of the traveling festivals. AmphitheaterEnglewood.com is not affiliated with any primary supplier, website, or official box office. We are an independently owned and operated company specializing in all sales in the secondary market. All tickets are priced to market and can fluctuate daily above or below face value. To order tickets for all Comfort Dental Amphitheatre events please pick up the phone and call our operators at anytime or click on the show of interest and follow the steps online through the checkout.